There is no better way then to enjoy the wild rushing waterfalls of Nepal then by abseiling down them. This popular and safe pastime is loved by clients and guides alike! It provides heart pumping adrenaline as you lower yourself off waterfalls as high as 25 meters and repel your way down to the bottom. Canyoning is the sport of traveling down or in canyons using different techniques that generally include hiking, abseiling, jumping, climbing, swimming, and sliding. Canyoning is a sport that has a fantastic fan base that is growing all around the world. Around the world many people do canyoning in mountain canyons with moving water. Naturally here at Adrenaline Rush Nepal we love an adventure sport where you can get wet! Here at Adrenaline Rush we got in early on the new upcoming sport of Canyoning in Nepal. From the moment our owners started canyoning - we loved it. What a rush! As thrill seekers and nature lovers our new ventures into canyoning was not a giant step. We have been successfully running canyoning trips for the past 6 years in Nepal. As canyoning gains in popularity here in Nepal and across the world we have had great opportunities to further the sport here in Nepal. We've aided our guides in receiving training and certificates from some amazing teachers from abroad. The majority of our equipment is purchased from the west with their amazing quality and safety standards in mind. Our dedication to safety and absolute joy of being in the canyons has made our company one of the most trusted and respected canyoning companies in the country. We are proud of canyoning in Nepal and all the untapped adventures yet to come in this upcoming sport. Our favourite place is a canyon not to far from our home on the river in the stunning Jalberi canyon. It is one of the most popular canyoning spot in Nepal known for it's unrivalled beauty and great canyoning aspects. Much like the river, as we canyon all year long we change our routes depending on the water levels. A short 30 minute hike puts your right in the middle of our favourite canyon with a variety of waterfalls with abseils, slides and jumps abound. A day of canyoning here usually takes around 3 -4 hours depending on the group size. Here at Adrenaline Rush we don't belay you down like other companies. We let you do the work. We start with a thorough safety talk and careful instructions. At the top you take in the view a giant waterfall, stand in it's falling water, play in the pool. After some play time and practice with the rope, you are ready and start to lower yourself off the edge. Don't look down, unless you want to! Canyoning is a real rush and everyone moves at their own speed. And our professional certified guides will be there every step of the way for you to safely enjoy your time in the canyons. We take small groups to ensure the upmost safety and minimize the wait time for everyone. It is great all year for almost all ages. All you need is a sense of adventure and a little bit of daring. 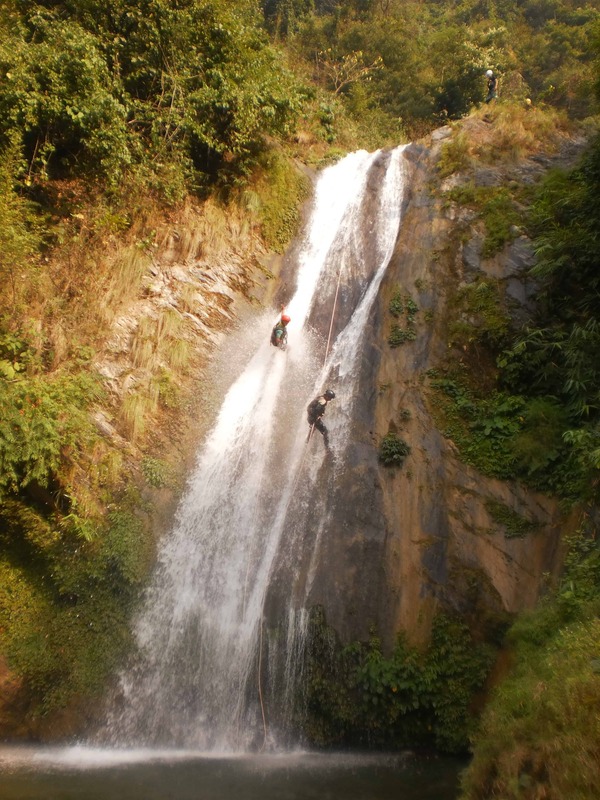 The canyoning is located Half way between Kathmandu & Pokhara, on the way to Chitwan. - Canyoning is a great add on combination trip combined with white water rafting or kayaking down the Trisuli, Marshyagndi and Lower Seti Rivers, any of our treks, kayak courses, and camp adventures. Don't forget about Chitwan Chitwan National Park and its famous jungle safaris. If you have the time we really recommend staying at evening with us at our riverside camp. The journey back and forth from Pokhara or Kathmandu to the canyoning spot is at least 3 hours each way. We never like any trip that puts you more on the road than in nature! We only recommend day trips to people with tight schedules. Here at Adrenaline Rush Nepal we have been running awesome and safe canyoning trips for people with a wide range of ages. Our imported professional equipment and professionally trained staff combined with our high safety standards makes our company one of the top picks for canyoning in Nepal. We were the first company to do canyoning year round. Yes that's right. Even in monsoon our staff goes out into the big water canyon! We do this safely by altering our routes depending on the time of year. Because of this the number of jumps, slides, and abseils may change. But don't fear our staff will be there to guide you safely and with enthusiasm at any time of the year.